There are many perks to investing in a 529 plan account. But, like with other kinds of investing, there can also be ways to hurt yourself financially. 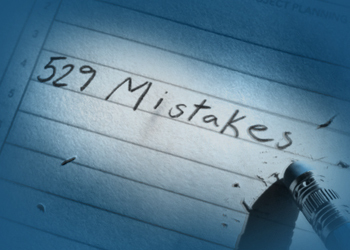 Learn how to avoid these seven common and costly 529 plan pitfalls. Sacrificing retirement for college savings. Juggling multiple goals can be tricky. But one thing's for sure: When it comes to choosing one over the other, it's best not to sacrifice retirement over college savings. Why? For starters, you can't get a loan for retirement, but your son or daughter can get a student loan for college. You also don't want to depend on your kids in retirement. It's likely to cost more to support parents in retirement than to pay off student loan bills. Forgetting to rebalance. Many 529 plans, like this one, offer age-based investment options that rebalance automatically. But if you opted to manage your own investment strategy, it's a good idea to rebalance it each year. Your initial asset allocation could have become lopsided over time, which means it no longer accurately represents your original intentions. If that's the case, you should remember to rebalance your holdings. Do it the same time each year to avoid knee-jerk reactions to a volatile stock market. Remember, the IRS allows you to change investment options only once per calendar year. Cancelling automatic investments during hard times. For most of us, investing means contributing to our portfolios a little at a time through payroll deductions or automatic investing. If that's you, you're employing an investment strategy called dollar-cost averaging. * This means you're purchasing more shares when prices are low and fewer shares when prices are high, which results in a lower average cost per share. Stop automatic investing and you'll stop benefiting from dollar-cost averaging. Or worse, you simply won't get around to investing at all. Assuming a scholarship will cover the full cost of college. The good news is, there are lots of scholarships your child can and should apply for. The bad news is, chances of getting a full scholarship are slim. It happens, but to the smallest percentage of students. Overlooking tax deductions. Because saving for college is one of the biggest financial challenges that parents face, many state lawmakers created special tax deductions for college savings. If you forget to report your contributions when filing your taxes, you'll be missing out on one of the most beneficial tax breaks your 529 plan offers. Assuming your 529 savings heavily impact financial aid. If your student is a dependent, only a small percentage of your 529 savings affect how much financial aid you can get. That's because the federal government considers your savings to be parental assets—counting at less than 6% as an expected family contribution (EFC). If your student isn't a dependent and owns the 529 plan account, the number rises significantly to 20%. * Dollar-cost averaging does not guarantee that your investments will make a profit, nor does it protect you against losses when stock or bond prices are falling. You should also consider whether you would be willing to continue investing during a long downturn in the market, since dollar-cost averaging involves continuous investment in securities regardless of fluctuating price levels. ** The earnings portion of nonqualified withdrawals may be subject to federal income tax and a 10% federal penalty tax, as well as state and local income taxes. The availability of tax or other benefits may be contingent on meeting other requirements.